This Ice Cream Play Dough makes a great sensory activity for kids. Icing – Any color or flavor that you would like. 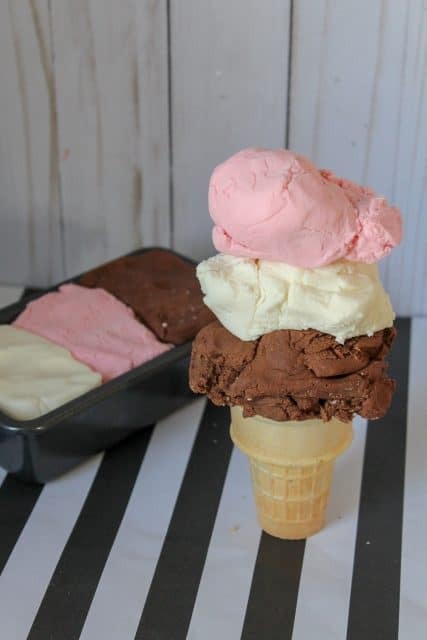 We used chocolate, vanilla and strawberry for this Neapolitan Ice Cream Play Dough. Next, mix your powdered sugar in. I start with 2 cups and slowly work my way up. Generally, I use close to 3 cups. This is so much fun for kids to make. When you start mixing the powdered sugar in, it feels so soft and ‘cloud-like’. They really love it! You will know you have enough powdered sugar mixed in when you get your desired texture and it is no longer sticky. Repeat the process for any other ‘flavors’ of ice cream you would like to make. For other fun flavors, you can always tint vanilla frosting and add in some fun extracts such as mint. For the vanilla, chocolate and strawberry flavors, no extract is really needed. They smell just like the real thing already from the icing! This is a great sensory item that leads itself to tons of pretend play! 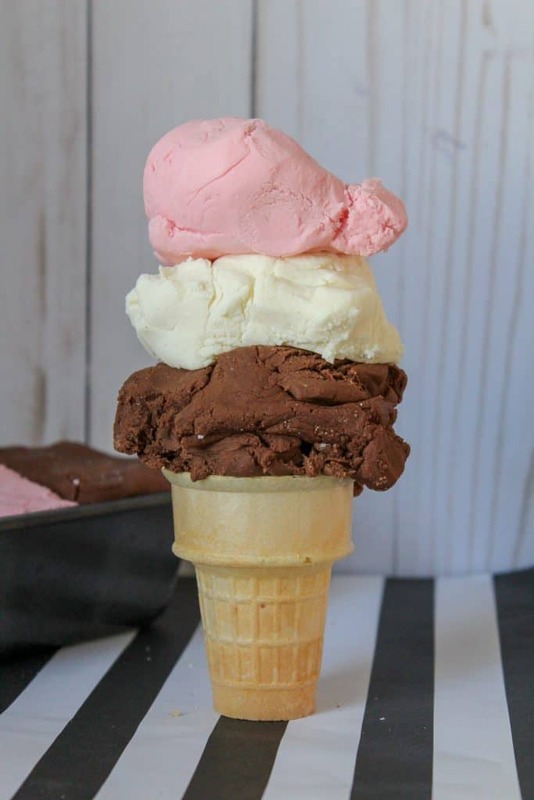 Bust out cones, sprinkles, and dishes for an ice cream party! Here are some fun pretend play items for the Ice Cream Play dough that your kids will love. If your kids love making Playdough, they’ll probably love these slime recipes.